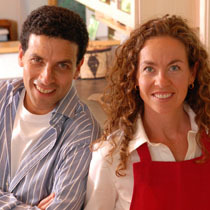 Jeff Hertzberg and Zoë François are the co-authors of the new book Artisan Bread in Five Minutes a Day. They've been kind enough to take a few hours out of their busy schedules and answer a few questions I had about the book. and to respond to community member questions about the recipes or techniques found in the new book. Floyd: I was surprised by the breadth and depth of the recipes in this book. I guess I expected something like the Sullivan Street no-knead technique applied to a couple of dozen other recipes and quickly rushed out the door by the publisher, since that is largely how I've seen other folks try to capitalize on this trend online. But I gather from your introduction that you two were working on this technique well before no-knead phenomenon took off, no? Zoë: The New York Times article Bittman wrote about Lahey's bread came out when we were nearly done with our manuscript. We were very nervous he had beaten us to this concept, wet no-knead dough that had a long rest. We realized quickly that our method took the concept much further, that we had something more to offer than just the wet dough. We weren't sure if Lahey was working on a book and if there was room in the bread book market for two, with a fairly similar message. After a while we came to understand what a gift Bittman and Lahey had given us. They really got people excited about baking again, this on the heels of the Atkins craze. Floyd: Heh. Yeah, the Bittman article in my mind marks the official end of the Aktins era. Zoë: I honestly don't think that so many people would have dared try our method had he not primed the way. He legitimized what we were doing for people, we didn't have to convince anyone that it would work. Well almost everyone got it! Having said that, once people try our method they will quickly recognize that it is quite different than Lahey's. Our dough is wet, but not as wet. We did this on purpose so that first time bakers could handle the dough without being frustrated. We also wanted to offer a variety of bread styles and traditional shapes, such as the pan d'epi, which couldn't be done with a dough any wetter than ours. The bread made with our dough can certainly be baked in a dutch oven or a cloche but it can also be made on a pizza stone and slashed to have a really beautiful and finished appearance. Jeff: Yes, our innovation was being developed long before the current no-knead craze began. What differentiates our particular no-knead approach is that we tested all our recipes with dough intended for storage, for as long as 14 days. No other book has ever looked at that, and this part of our book was being worked out by 1990, long before either of us knew that there might be a book in it! We didn't start trying to turn all this into a book until 2003, but that was still long before Bittman's Times article appeared. As Zoë says, we have little in common with the Lahey/Bittman approach except that our dough is wet and isn't kneaded; neither were new concepts. What's new is trying to store dough, and adapting that approach to the broad universe of baked goods from the many traditions that make up the Western baking menu. No other book or method that we know of has ever explored the possibility of long-term dough storage, and that's what opens up enormous possibilities for busy home bakers. So we're glad to have surprised you with some variety! Zoë: We also have several sweet breads that are based on the brioche dough, such as sticky pecan caramel rolls and braided pastries which couldn't be done with the other method. Floyd: Yes, I made your chocolate brioche (recipe) last weekend and it was excellent, much better than any other brioche I've made! Zoë: Floyd this is music to my ears! I can live out the rest of my days and know that I contributed something worthwhile to this world. I love brioche. I used to make it for the restaurants I worked in when I first left culinary school. My first boss came up with some crazy sandwich that involved individual brioche buns. It was a nightmare. They had to be watched and babied or the whole batch would explode or implode, depending on what else was going on in the kitchen and how warm it was that day. Our proof box was a rolling rack with a plastic bag over it. Not exactly a precise environment. It was literally the most finicky recipe we worked with. When I discovered that this concept of no-kneading and storing the dough would work for Brioche I was personally amazed and thrilled. It was my personal triumph with this project! I'd only wished that it had occurred to me a decade earlier! With the brioche recipe came the other sweet breads and dessert pastries. I'm a pastry chef by training so once I was let loose I just couldn't help but add lemon curd, almond cream and chocolate to various recipes. It was just plain old FUN! Jeff: Zoë is a pastry genius and I am a lucky, lucky amateur hack to have gotten a chance to write a book with her. She's taught me everything I know about fine baking! Floyd: On my first try, I came up with a hydration of about 65% on the master recipe (recipe). Does that sound about right? It was less wet than what I expected, but my flour may have been compacted a bit too tight. I think if I make it again I'd be tempted to make it a little bit wetter. Zoë: We struggled with using cup measures vs. weights, but in the end we decided on cups because most home bakers still measure that way. Unfortunately it means that some people are going to have the same experience that you did and end up with a dry batch or two. We purposely avoid talking about hydration levels and other lingo that might be intimidating for people who have never baked bread. Since your readers are clearly accomplished bakers and are most likely weighing their ingredients we will give you the break down. Our scoop and sweep method of measuring gives us a (5 oz) cup of unbleached all-purpose flour. The total weight of the master recipe is 2 pounds of flour. Using 3 cups of water we figure the hydration is about 75-78%. If you use a brand of flour that has a higher protein level, such as King Arthur, we suggest that the hydration be closer to 81-83%. Jeff: 65% hydration just isn't wet enough for long-term storage. We found that below some hydration threshold, the gradually diminishing gas content in the bread just didn't support a nice rise after the first few days. It seems that slack dough offers less resistance to bubble expansion (at least, that is how we explain what our experiments showed). The threshold seems to be around 75-78%; any drier than that and the batch doesn't store very well. Floyd: I made my first batch of the master recipe on my baking day last weekend. And, I must admit, I was a bit let down. It wasn't bad, but it wasn't as good as what I would have baked otherwise on my baking day. The following day we took a trip up the mountain to play in the snow. When we got back, cold and tired, I quickly shaped and let rise the second half of the dough and baked it to accompany a pot of soup we reheated. The second batch came out much better, I think partially because I let it rise longer (more like 90 minutes instead of a minimum 40), partially because it had more time to ferment, and partially because nothing hits the spot like a home cooked meal after a busy day like that. Jeff: 40 minutes is the minimum time to allow the dough to rise. If the ambient temperature of your house is cool, say below 65 degrees then it is a good idea to allow the bread to rise longer. If you have the patience, the longer and slower the rise the better. But we wanted people to be able to get a fresh loaf of bread to the table after working all day, so we found that 40 minutes for a 1 pound loaf was quite doable and produced a great loaf of bread. Floyd: Gotcha. Well, what clicked for me while eating the second batch was that, fine, an experienced baker like myself can put in time and effort and make a better loaf of bread: making real artisan bread is an art. But a less experienced or busy baker can spend next to no time using your technique and still turn out a remarkably good loaf of bread, even on a work night or after a day in the snow. Zoë: I had the same thought when we first started to test the recipes. I figured it didn't really count that I could make them because I'd gone to school to study this stuff. It also didn't count that Jeff was able to produce gorgeous bread because he had been doing it for 20+ years. We needed to give it to rank beginners, those who not only didn't bake but were afraid of it. My mom was my first tester. I figured if she could do it we were really on to something. A week went by after I sent her the recipe and she still wouldn't try it and then she finally did. She was hysterically laughing and said "you would never believe the beautiful loaf of bread I just pulled out of my oven!" then I knew it would work. She has been baking almost daily for 1 1/2 years now! Jeff: Floyd's experience (better bread once the batch starts to age) jibes with that of our readers, especially the ones with lots of experience in the traditional method. Unless our batches age a few days to mature and develop fermentation by-products, experienced bakers familiar with sponge and levain methods may miss the complex flavors they love. On the other hand, we've been very successful with experienced bakers when we can convince them to hold onto the batch, and maybe even avoid baking at all on the same day as the batch was mixed. All this feedback comes from the blogosphere; I don't know how anyone used to get feedback from readers before the Web changed everything. Did people actually write letters? With a quill pen? Floyd: Amazing, isn't it? I know many of us here on that site still marvel at how quickly we can help each other, even getting tips between the time a loaf is shaped and when it is put in the oven. Speaking of the site, a couple of the misconceptions I strive to overcome on the site and that I think you two do a good job refuting are that: 1) bread baking is by definition difficult, and that 2) you have to follow recipes precisely to bake a good loaf. I am constantly amazed at how resilient most dough are and how much flexibility the baker has. Yes, from beginning to end it is a long process, but there are any number of points along the way where you can pause the process so that it fits your schedule. If anything, most breads improve from being refrigerated or folded so that it has to rise again. And rarely does letting loaf rise 90 minutes instead of 75 cause major problems, so you should relax and enjoy yourself while baking. Modify the recipe to fit your schedule rather modifying your schedule to fit the recipe. Zoë: Floyd, your approach is a breath of fresh air for serious bakers, because even serious bakers struggle with the time constraints of modern life: jobs, friends, families, and running households. Your site rejects the idea that it all has to be absolutely perfect and restaurant-ready. Floyd: Ha! You can say that again. Some of the breads I've posted, even in my lessons, are ridiculously ugly. Zoë: Right, but that's not what home cooking is about. Home cooking is a practical art that should bring joy into everyday life, not be reserved for special occasions. That's all we were trying to do with this book. Floyd: Indeed. And your technique is like the 80-20 rule applied to baking: you can get 80% of the way to making great bread with this approach using 20% or less of the effort of the traditional methods. Jeff: We are hoping that this method will get people who have been intimidated by bread baking back in the kitchen. Once they are comfortable baking this bread they might have the confidence to try some of the more traditional techniques and put in that extra 80% effort. That would be very exciting! For others it is just an issue of time and this method produces a really great bread with very little time commitment. Floyd: I baked your rye (recipe) Friday and Saturday and enjoyed it very much, Jeff. I used Bob's rye flour. It came out nice and light and made great sandwiches the next day. Jeff: I sweated over that rye bread. This was the bread that got me obsessed with yeast baking in the first place, and I wanted it to be great. The struggle was, how much rye? Because I knew that most of our audience would not seek out true medium rye (lower in bran), I kept the fraction of rye relatively low. Most of us in the U.S. will have easy access to Bob's Red Mill rye products, and Hodgson Mill Rye (Pillsbury seems to have stopped distributing their's nationally). Bob's and Hodgson are tasty products, but very high in bran, which absorbs lots of water and yields a result that's less "custardy" than classic sour ryes. In order to get "custard" with the high-bran products, I had to push the hydration to the point where novice testers were having trouble shaping it and sliding it off the peel. Since I knew the high-bran products are what our readers would generally use, I kept the rye fraction relatively low, and the reception has been great. The best ryes are made with true "medium" rye, and the only place to get it has been King Arthur Flour by mail order. If you have medium rye, by all means, experiment with pushing the rye fraction. At some point, you'll find that the rise isn't great (only wheat flour contains enough gluten to support great rise), and you may want to add a little vital wheat gluten (VWG). But you can see why I didn't want to start with this for novice bakers. Monkeying with VWG takes some experience. 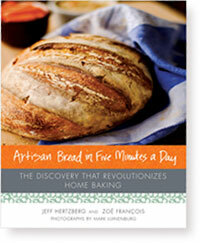 Artisan Bread in Five Minutes a Day is available now from St. Martin's Press/Thomas Dunne Books. The website for the book is artisanbreadin5.com. Update: This thread is now closed. Thank you Jeff and Zoë for taking the time to answer out questions! I'll start off by saying how much I appreciate the fact that you have undertaken this project. Here in America we have been blitzed with marshmallow bread and fast food for so long that we are on the brink of losing the basic skills to produce many of the wonderful foods our parents and grandparents grew up with. I'm nearly 60 and I'm the only person in our circle of friends who makes an attempt at Artisan breads. A few do sweet breads and treats but it is a shame so many people think baking is to difficult. I'll confess I haven't bought your book yet, but I plan to. I have fiddled around with the master formula and let a batch ripen in the fridge for 5 days before I started to take from the bucket. The first batch I needed bread so I couldn't resist and I baked it in the same day. For me, baking is a mind set. Once I got to the point I could make a few different types of bread without digging out a book or a recipe from here, It was riding a bike. However, I have failed to get anyone in my family or any friends to join me in the pursuit of good bread. So, your timing is good. My first project is to gift your book to my 83 year old father who has expressed a mild interest in my new baking hobby. He is recently widowed and is finding he likes to cook for the first time. I need a book that I can refer to and send him a copy so he can follow along. Your book sounds like the perfect way to get him started experimenting with flour. I know if I sent him the BBA his eyes would glass over. He needs a path to victory that won't be intimidating. So, thanks for giving me the tool to spread the love, so to speak. I'd love to ask you some deep question about the formulas but I should get my hands on a copy of the book first. From Floyd's comments it sounds like you have shared some very interesting breads that will be fun to learn. I have no experience with sweet breads at all but we all love to eat them so it's about time to take the plunge. Good luck with the book, I'm looking forward to seeing it. This is a photo of a loaf that I started on Thursday and baked today from the recipe in your book. My wife likes it a lot, and I get better rise from this recipe than any other whole wheat bread recipe that I have tried. My question is about baking a loaf from the master recipe. I find that they tend to end up excessively moist in the center. I am wondering if 40 minutes is too short a time between removing the dough from the refirgerator and putting the shaped loaf in the preheated oven? Maybe they are still too cold inside. I baked another loaf of the master recipe tonight. This one had been in the fridge since last weekend and was more in the range of 75% hydration. When I opened the container it had a really hoochy, alcoholic smell. I was afraid that was going to give it an off taste, but I guess that must have all baked off because it tasted fine. Pretty little blisters on the crust and much more of the nuttiness I expect in a well-fermented dough. Nice crumb on the ends! The center was tighter and still a bit too moist, most likely because the dough was still not up to room temperature when I put it in the oven even though it had been out for a couple of hours. And, yes, I was baking a slightly larger loaf, around a pound and a half. I'm tempted next time to try flattening the dough out a bit to let it warm up for an hour or so before shaping it for a final rise. Your thoughts? I don't have your book yet, but it is on my list. I'm curious about something. I have my first batch of your Master Recipe on the counter right now. Say I wanted to use part of the dough for a cheese and olive bread. Could I cut off a chunk of the dough, gently knead in my additions, let it rise and bake? How would this extra knead and rise affect the quality? Last night I mixed up a batch of the rye and I plan on baking it tomorrow, so I'm excited to taste this as well. I have one question in about the general method - is it really necessary to let the dough completely rise and deflate at room temp before placing it in the fridge? When I made the master recipe before, I didn't have time to wait so I placed it straight away in the fridge after mixing up the dough. The dough must have been warm and active enough that it went through the rise and deflate process over a period of 1 - 2 days in the fridge, so that led me to wondering whether there is an advantage having the initial rise at room temp? Just a note to anyone that had tighter crumb in the center - I found that if I wait til the whole loaf is wobbly ( no matter what size or temperature the dough is, or how long it takes) before it gets baked, then the loaf has an airy crumb throughout. Hi Jeff and Zoe. Thanks so much for taking the time to answer our questions. I'm using KA AP flour, weighing out 2 lbs on the scale, and I finally got that I should be adding more water (I got it just now, reading through this thread), so this may answer some of my questions, but even so, I'm going to ask them anyway. Up above, you talked about the bread producing a thinner, crispier crust on a stone. I've been using a stone with cornmeal (on the middle shelf) from the beginning, and I bought an oven thermometer to make sure I'm baking at 450 (my oven was over 50 degrees on the cool side), but even so, my crusts come out much thicker and harder than I think they should. The crumb is nice, but the crust is very hard. The temperature in my kitchen is about 68 degrees. I've been letting the shaped dough rest for 40 minutes to an hour and a half on the peel, but the crust is the same each time. I can't figure out what will make it thinner. Another question: The other night I kneaded some additions into the dough before shaping my loaf. I tried to be as gentle with it as I could, and next time I'll try stretching and rolling as you mentioned above. But say I was to knead the additions in, how much resting time does the loaf need to build up the gasses again? And if I were to stretch and roll, how much resting time would you recommend? Does the dough build up gasses again easily after being handled like this? And on the same line of thought... I hear the gasses escaping every time I reach in the bucket and grab a hunk of dough to cut off. Is there a way I can pull the dough out of the bucket without such a loss of gasses? Thank you both for confirming my thoughts about the initial rise - from now on it will be straight in the fridge for me, unless I intend to bake that same day. More on wobbly... Jeff you probably do know exactly where I'm going with this. First of all I must say that most of my baking is with up to about 1/3 - 1/2 of the flour as wwflour and the rest white, so I don't have much experience with rye or other flours. In order for me to determine when it is the correct time to put the loaves/rolls in the oven, I first of all look at the increase in volume (which usually tells me nothing unless it's in a loaf pan), then I do the poke test, and then, when I think it is ready, I do the ultimate "jello test". It's the only way I can ready describe what I'm looking for. The whole piece of shaped dough, inside and out, should wobble like jello. If it's a free form loaf (on parchment) then I wet my hand before placing it on the loaf and quickly but gently, give it a good shake to see if it wobbles throughout. If it's in a pan or rolls on a baking sheet, then I just shake the pan or sheet and try to get the same idea of what is going on inside. I find that the outer portion of the dough gets airy before the center so I always try to make sure that the center is light as well before it gets baked. Tonight when I bake the rye loaf I'll pay special attention to see if there is anything else I forgot, but as I said before I don't have experience with rye so I hope I'm not asking for a brick with this method! Eric: beautiful loaves!! Why do you want to bake at a lower temp next time? Wow - this is wonderful bread!! I was very happy with the result - lovely texture and it tastes just like I was hoping... I'm hooked. It took 3 hours at approx 20C -21C room temp from the time I took the container with the dough out of the fridge until it was ready to be baked. It did feel slightly different than other doughs without rye, so I didn't let it get quite as wobbly as I normally would, but I'd say it expanded to at least 2 -3 times it's original size. Nice oven spring, thin crisp crust, a few large holes here and there, but for the most part the crumb was quite even throughout. The flour I used was 11% AP and dark whole rye, and luckily these are both available in most stores because I think I'll be making this alot! How long until a second edition? I baked 4 dinner rolls from the master recipe last night, and the flavor and oven spring were excellent. (I did a half recipe using only 1 tsp yeast letting it rise on the counter for 5 hours, then refrigerated 1 day.) The thin crust was on the soft side, with little caramelization. I'm not sure my toaster oven really got up to 450, though I imagine that with a small stone in there I could get a crisp crust. I have most of my remaining dough formed into a loaf, but I saved back about 4 ounces to see how the dough tastes after several days. I transferred it to a smaller container. I can see that if I kept 2 or 3 batches of your dough going, I would need to transfer to smaller containers for space considerations. Is there any problem doing that? Would the dough need to be handled quite gently during this, or does it recover a bit? I was doing a strange shape tonight, so I did a few stretch and folds before shaping. I don't know if this is a no-no, it just felt right. Too bad I was in too much of a hurry to let it rest long after the folding. And my last question tonight. 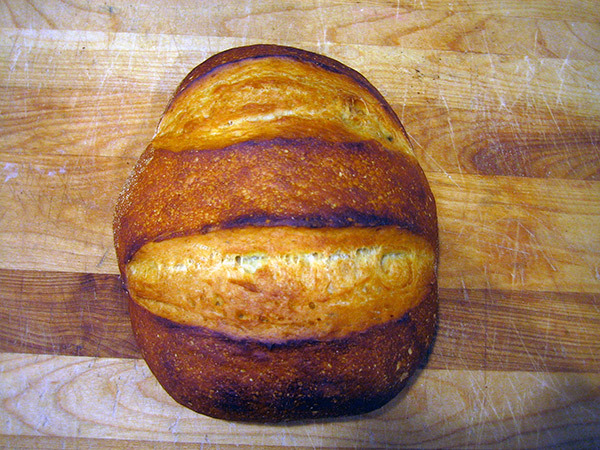 Have you tried inoculating your doughs with a sourdough culture instead of commercial yeast? I would rather use wild yeast, but don't know enough to try to predict how it would react to the long term dough storage. Thanks for all of your help! I plan to get the book, but don't have it yet, so I apologize if all these questions are answered there. I am an avid reader of the forum but never post. I'm a novice bread maker and have a basic question about the no-knead bread. I saw a post on another thread that said they punched down the dough every day in while in the refrigerator. Is this necessary? Have I ruined my batch since I haven't been doing this? When I open the lid, it's still very wet. Thanks. I have lurked about this site for the past year, envious of everyone who had the time to make artisan bread. My family loves to have really good bread but because my boys are allergic to sesame seeds and nuts, we just could not buy a good artisan loaf from a bakery because of concerns about cross-contamination (mixing one batch with nuts/seeds, then the next batch without, getting traces of the nuts/seeds). Unfortunately, my very busy schedule ended up making it nearly impossible to make homemade bread on any consistent basis. However, your "five minutes a day" technique is really great for someone like me because of the flexibility of time. This refrigerator-proofing step is just another great tweak to this technique. I'll have to try it. I just recently made some caramel sticky buns using the brioche dough and it was just great. So, maybe someday I'll graduate to a more traditional approach to bread making (when I have the time), but for now, I don't have to sacrifice time for some really good loaves. Thanks. I had problems with the hydration level because of the type of flour I use (King Arthur AP seems to have a higher protein content). I have found that by baking on parchment paper placed on the stone, instead of using cornmeal and baking directly on the stone, the issue of the rounded and cracking bottom just goes away. When I bake on the parchment paper, the bottoms of my loaves are flat, just as they should be, though they don't brown up very much. But I solve this by turning the loaf over for the last 5 minutes of baking. The loaves come out just fine, even with the lower hydration, though I can definitely tell a difference in the character of the crumb in later batches after I got the hydration right. 5 days ago I mixed up a batch using 1 cup of Hodgson Mill Rye flour along with the AP flour (and I added that extra 1/4 cup of water!). I didn't have caraway seeds when I mixed the dough, but by the time I cooked up my first loaf last night, I had gone to the store to buy some, so I sprinkled them on top of the loaf. OMG!!! It's the taste I've always loved! Next batch I'll add the caraway seeds to the dough, for sure! And I know exactly what I'm taking to the superbowl party on Sunday! Thanks again! I took 3 different loaves to the superbowl party and they were all big hits -- a boule from the master recipe, a rye caraway swirl, and an epi. The host of the party was kind enough to let me use his camera, so I actually have some pics. Some of them are awfully blurry. Sorry. 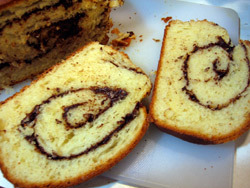 This is the rye caraway swirl. The dough was 8 days old. 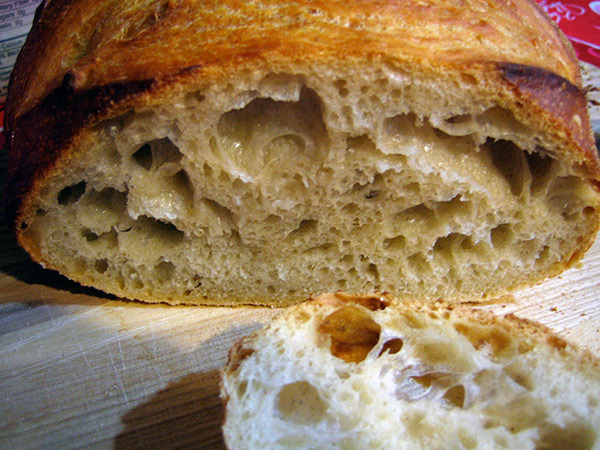 Not as many holes as I'd like, but the crumb was soft and really tasty. I shaped the loaf last night and let it sit in the fridge all night, then put it in the oven almost straight from the fridge. 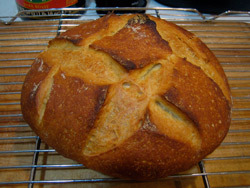 I used the last of my under-hydrated boule dough for the epi, which seemed to equate with the epi recipe. The dough was about 12 days old with nice sourdough notes. This loaf was shaped and rested just prior to baking. The boule dough was 1 day old. I'm hoping the lack of hole structure is because the dough is so young. Strangely enough, it had an almost sweet flavor. Maybe it's because I've been baking from more aged dough for the last couple of weeks? Shaped and rested just prior to baking. I made a bath of the master recipe for the first time on sunday. I have made the rye recipe with great results. i made little dinner rolls on tueday with a bit of the master recipe and it was quite tasty except it tasted too salty to me. i used regular table salt. is it possible to reduce the salt to 1tbl and still store it as long as 2 weeks? what should i do? the bread is wonderful, just quite salty. ascorbic acid in Harvest King flour? I have a bag of Harvest King flour and it doesn't list ascorbic acid in the ingredients list. Where do you see ascorbic acid listed?